If you are thinking of remodeling your bathroom, do something that will make an immediate impact on your happiness. A whirlpool tub is a great way to put a smile on your face every day. Stress Relief – Whirlpools are a great way to relieve stress. The time alone in the swirling water is sure to relax you, and that helps to relieve your muscle tension caused by stress. Physical Relief – When you hear about professional athletes spending “time in the tub”, you are hearing about physical relief from professional size aches and pains. 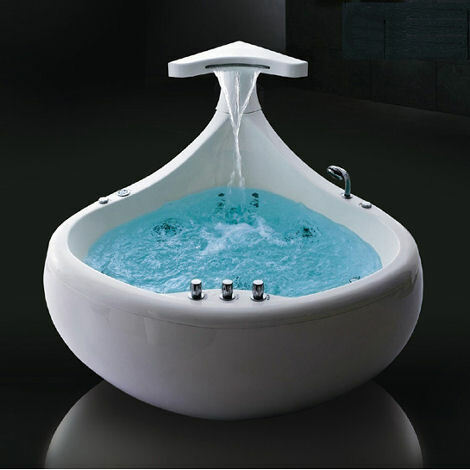 The jets pushing water through the tub help improve blood flow to sore areas of your body. This aids in removing lactic acid from the affected region and helps relieve muscle and joint pain. Blood Pressure – This comes from the combination of the two reasons listed above. The stress relief is clearly an important factor in lowering blood pressure. The increased blood flow mentioned earlier helps to lower blood pressure in addition to its soothing affects on sore muscles. Better Sleep – The relaxation and easing of aches and pains helps you to fall asleep faster and get better sleep. This information comes directly from regular users of whirlpool tubs who report better sleep experiences after using their whirlpool. Weight Loss? – Though still being studied, some research indicates that regular use of whirlpools can increase metabolism, which helps in weight loss. Therapeutic Uses – Whirlpools are used by hospitals for purposes such as arthritis relief, easing labor for expectant mothers, and aiding physical rehabilitation. A whirlpool tub for your own personal use can help with problems such as these as well as other physical issues which may creep up in the future. Outer Banks Kitchen Renovations can help you turn your bathroom into a pleasure and wellness center for your personal use. We specialize in kitchen and bathroom renovation on the Outer Banks and have been serving the beach for almost half of a century. Call Outer Banks Kitchen Renovations today and put a smile on your face for years to come.